Editor&apos;s update: Kevin Counihan, CEO of the federal health insurance marketplaces, announced late Tuesday that the deadline for signing up for a health plan under the Affordable Care Act has been extended by two days — until 11:59 PST December 17. "Unprecedented demand and volume" of consumers contacting HealthCare.gov and the exchange&apos;s call center forced the extension, he says. Hundreds of thousands of people were able to enroll successfully, but well over 1 million consumers were not able to enroll in the past two days and, instead, left contact information for later enrollment. Several states, including New York and Minnesota, have announced similar extensions. This is the last week to choose a health plan under the Affordable Care Act if you want insurance coverage to begin by Jan. 1. And officials who have spent the past two years using the carrot of persuasion to get people to buy insurance through the state or federal exchanges say the time has come for the stick. That stick is a hefty fine. Penalties for failing to buy insurance will roughly double. A family of four that makes $250,000 a year could face a fine when tax time rolls around in 2017 that approaches $10,000 if they don&apos;t get coverage for 2016. Kevin Counihan, CEO of the federal insurance exchange HealthCare.gov, says he thinks the high fines will induce people who didn&apos;t have insurance before to at least shop around before deciding to skip coverage again. Counihan, who was director of marketing for the Massachusetts health exchange 10 years ago, says it was when the fines approached $1,000 that sign-ups jumped. "It got people&apos;s attention," he tells Shots. "And there seemed to be more of a discussion in their head about whether it made sense to pay the penalty and not get something for it." Research bears out Counihan&apos;s theory. A study published in the American Economic Review in March showed that as fines got higher in Massachusetts, more people opted to buy insurance — and the overall medical well-being of that population improved. In 2016, an individual who doesn&apos;t buy insurance will owe at least $695. The minimum fine for 2015 is $325. The 2016 penalties could reach the thousands — from as much as 2.5 percent of a person&apos;s income, up to as much as the average annual price of a "bronze plan," the lowest-cost health plan available on the insurance exchange. The Department of Health and Human Services, which runs HealthCare.gov, tried to make as many people aware of the fines last year as it could, without giving too much of a sting to those who didn&apos;t buy plans. The agency allowed people who owed money because they didn&apos;t have insurance in 2014 to sign up for 2015 insurance during a special enrollment period. Counihan says people shouldn&apos;t plan on another such reprieve. "We&apos;re not offering that this year," he says. "The deadline for enrollment is Jan. 1. That&apos;s a solid deadline." 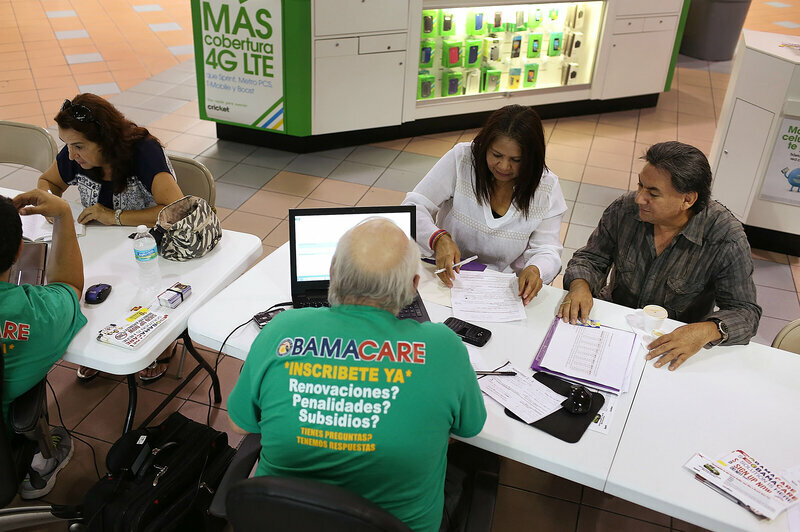 If you want insurance that kicks in on Jan. 1, however, you have to enroll this week. That means insurance navigators — the people who help consumers choose a health plan — are busy explaining the fees to consumers. Katie Nicol is senior manager of public benefits and insurance navigation at Whitman-Walker Health, an LGBT-focused health center in Washington, D.C. She oversees 11 full-time navigators, and says many of the clinic&apos;s clients are shocked to hear how big the penalties are going to be for 2016. "People understand generally that there&apos;s a penalty," Nicol says. "But the majority of the time they don&apos;t know what that means — definitely not the amount of money that it is. There is a bit of shock of realizing, &apos;Wow, if I don&apos;t do this, I will likely be responsible for over $600 in penalties." Many of Whitman-Walker&apos;s patients qualify for Medicaid. But because the health center is located in a rapidly gentrifying neighborhood, it also has many clients who are young and single professionals. Doctors, nurses, and pharmacists at the clinic refer all of their patients without insurance to in-house navigators to help them pick a health plan and enroll. These navigators try to explain all the costs a patient will face, depending on whether they choose insurance and what type. "It&apos;s not just about the penalty," Nicol says. "It&apos;s also [about whether] you need prescriptions, if you need medical care. It&apos;s almost doing a cost-benefit analysis." Leighton Ku, who directs the Center for Health Policy Research at George Washington University, says the stakes in 2016 go beyond any one individual&apos;s costs. "There&apos;s information that clearly shows that the creation of the insurance mandates and the tax penalties bring more people into the insurance market," Ku says. "That helps bring insurance costs down." Bringing down the overall costs of health plans will take time, however, he says. In the meantime, the monthly premiums for health plans that take effect on Jan. 1 have gone up — an average of about 7.5 percent over the monthly premiums in 2015.